Right from the first time I stepped on a motorbike - I was hooked. Riding a motorbike became my ultimate favourite thing to do in the entire world. But I never travelled around the world by motorbike though. All the traveling I did in the past was backpacking and was hopping from plane to bus, train and tuk-tuk. After quitting my job, I booked a one-way ticket to India. It was in the town of Manali, that I realised how easy it was to rent a motorbike there. I gave it a shot, rented a Royal Enfield Himalayan for three weeks and rode 3,000 kilometers around Ladakh, Jammu and Himachal Pradesh. I even ventured all the way into remote Zanskar valley by myself and had my first real off-road experiences there. I loved riding that motorbike so much, and was so devastated when I had to return it - that the seed was planted for something bigger. Why not buy a motorbike in India and start riding it towards South-East Asia? Excellent idea, I love your thinking! So I did it. Riding around Ladakh on a Royal Enfield Himalayan had been so much fun, that I decided to buy one. Coming from the Ducati Monster 796 I was riding at home - that was massive step down. I know. But - the roads are pretty bad in this part of the world and full of dogs, cows, people, trucks and potholes. A lot of horsepower is not going to be of much help here. Plus, Royal Enfield shops, mechanics and spare parts are pretty much around every corner. 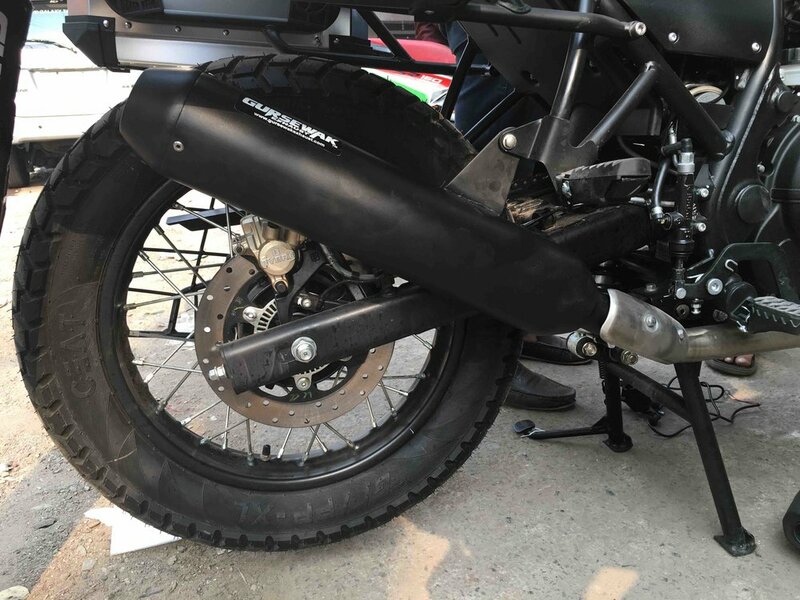 Not so much for Ducati. 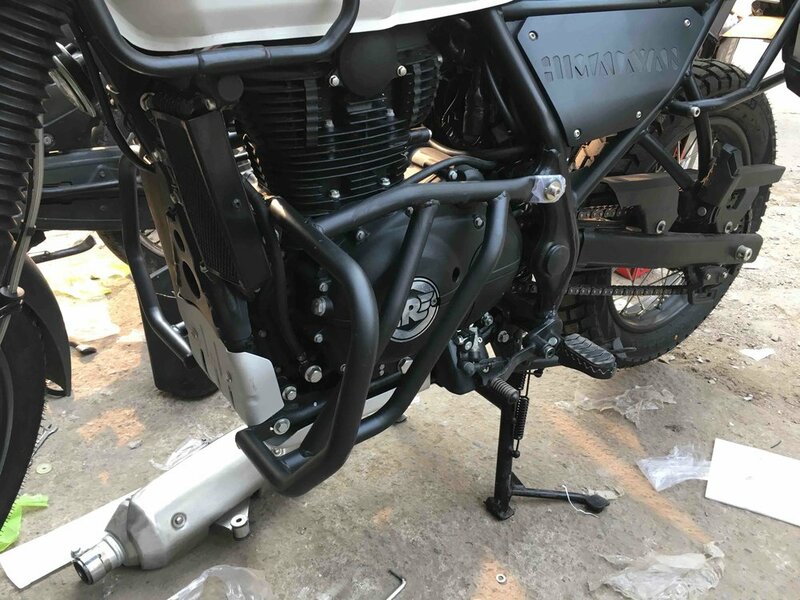 It took 10 days before the bike finally arrived at the Royal Enfield Shop. I named her Basanti - after a famous horse in a old Bollywood movie. Or so I thought. It turned out that the horse was named Dhanno, and Basanti was the rider. Aaah well. 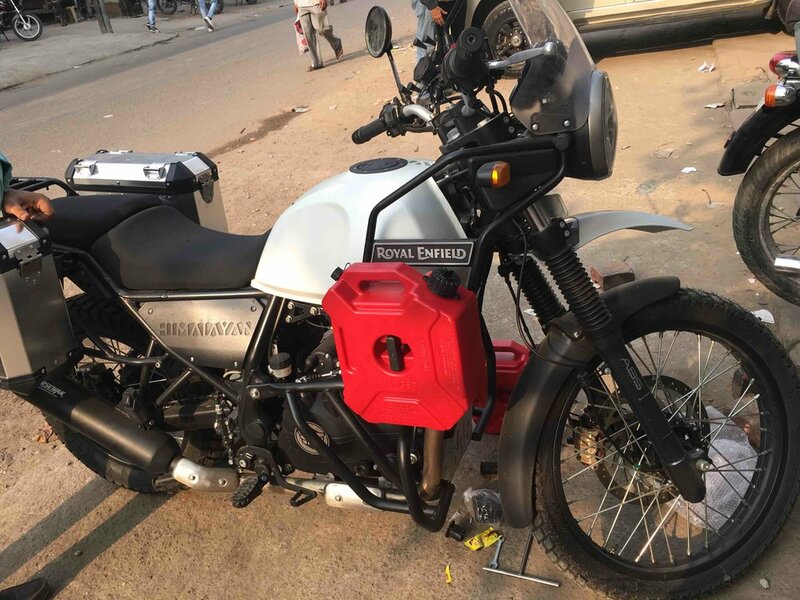 Picking up my brand-new 2018 Royal enfield himalayan! Don’t expect to ride away into the sunset when you get a brand-new bike in India. Once you’ve got it, you still need to wait somewhere between 30 and 60 days before you get your permanent license plates and RC (registration card). In the meantime, you’ll ride around with temporary plate numbers and a temporary RC slip. I don’t know who came up with “patience is a virtue” - but the waiting was horrible. With nothing else to do - I started modifying the bike to keep myself busy. This is what I did. Removed the weird protection rack in front of the back wheel. This protects a saree from getting caught between the wheel. No need for that! Fixed her up with some knuckle guards. It was also the perfect time to learn something about the bike. Because I literally knew nothing. Everyday I went to the mechanics shop to get lessons. We started with the basics. Get the motorbike on mid-stand. Sounds fairly easy. Well, it’s not. It took an embarrassing two hours before I finally mastered the technique to get it on mid-stand. Bravo! Lesson 1 was complete. We took it from there. I learned how to change the clutch cable, fuses, brake pads, oil and oil filter. They taught me how to tighten the chain, clean the air filter, change the tyres and how to get the battery out. During the classes, we were always on the look-out for police. All the motorbike repair shops had the bikes parked on the streets. The shops were so small that they couldn’t fit any bikes inside. But, parking them on the street was against the rules. So the police entered the street once or twice every day with a couple of tow trucks. They would randomly seize bikes that were parked there. Its owner would then have to pay a hefty fine to get it back. So whenever the first look-outs spotted the police, panic would brake out. We’d hear shouting and people running through the streets and jumping on motorbikes. “Madam, madam! GO GO GO now! Come back in an hour” was shouted to me several times. At some point I realised I needed a Carnet to enter Myanmar and several other countries on my list. After some searching online, I found the procedure (or so I thought) and applied for an ATA-Carnet. The issuing authority of an ATA-carnet in India is FICCI (Federation of Indian Chambers of Commerce & Industry). Just to make sure my application got through, I paid them a visit. A very friendly woman there told me I was applying for the wrong papers. It wasn’t the ATA-Carnet I needed, but a Carnet-de-Passage. She gave me the contact details of the WIAA (Western India Automobile Association) which is stationed in Mumbai. Then this insanely weird procedure started. A woman picked up and told me she can get me the Carnet-de-Passage I need. Moreover, she told me, I’m in luck, because the chairman of the WIAA happens to be in Delhi the very next day! She emailed me a list of documents I had to bring. And cash. Lots of cash. I managed to get part of the money and all the required documents ready within 24 hours. So the next day I met Mr. Dossa at a hotel’s restaurant at Connaught Place, in Central Delhi. He was quite surprised to see my face and made all sorts of inquiries about my age, country and job. Next, he spend a significant amount of time stressing that I should find an Indian boy to marry. He could not get his head around the fact that nobody ever proposed to me. Not ever? No, Mr. Dossa. And thank you very much for pointing that out. Then we got down to business. I showed him the paperworks and handed him a gigantic stack of money. 100,000 rupees in cash. He didn’t even blink and shoved the money in his pocket without even counting it. We both ordered a massive thali and chitchatted about his family and career. He insisted I didn’’t pay for lunch and we agreed to meet the following week so he could hand me the Carnet-de-Passage. In return, I then had to hand him another 200,000 rupees in cash as security deposit. To get that security deposit back (in theory), I had to bring the bike back to India within a years time. Make no mistake, the Carnet-de-Passage is real. The issuing authority is real. But honestly - when did a chairman of an Automobile Association ever buy you lunch? While you handed him a pile of paperworks and stacks of money in cash? Just to receive an official, internationally recognised paper? That’s right. Only in India. And while waiting for the paperworks to be finished - I just kept exploring the best things to eat, to do and to see around Delhi! By motorbike obviously.